I stood in my attic and pondered the future. With sweat dripping down my forehead, I looked at the possibilities, and all I could see was work appearing before my eyes. I had space for a new listening room, but it was going to be one of those undertakings -- the kind most homeowners avoid like a rotting roof. But with a new daughter quickly becoming mobile, and the thought of future birthday parties in my downstairs living/listening room and peanut butter on my speakers, the inevitable decision was made. A new listening room, at least in concept, was conceived. Being an audiophile of the highest order dictated that I not do this project simply, but instead make it as complicated as possible in pursuit of musical nirvana. I had visions of a perfectly neutral listening room isolated from the rest of the world. No sooner had I descended from my attic than the wheels began to turn. Time to get started. My house was designed and built to be a one-floor home. My wife and I wanted a "retirement" home -- one where there would be no stairwells when our knees finally said "uncle." I should have realized that we were too young for that kind of thinking. Id pay for that decision -- in labor, materials, and design work -- with this retrofit. One issue with my home was that there was no direct access to the area that would become the new room except a set of pull-down attic stairs. Id have to have a stairway built. But access wasnt the only issue -- oh no. There were structural issues, too. The floor framing in the proposed space, for instance, was never designed to support the weight of very large speakers and heavy electronics. Serious work would have to be done to shore up this area. The bottom line was that major construction issues would dominate the first six weeks of the project. The manner in which this work would be completed was also of paramount importance. Building codes are strict in North Carolina due to our past run-ins with storms. I live in the hurricane-plagued Cape Fear region, just about 250 feet from the Intracoastal Waterway, so structural integrity and hurricane resistance would be factors in the construction decisions. Generally speaking, this translates to more complex, stronger building techniques and increased cost. And lastly -- but most importantly, due the rooms intended purpose -- was sound. I had no idea what the space would actually sound like, so acoustics would need to be addressed from very early on. I wasnt going into this investment without a full commitment to great sound. So Id need an expert, a very good expert, for that. This was the first batch of initial issues, but as is usually the case with any substantial home-improvement project, there would be more that I had not anticipated. 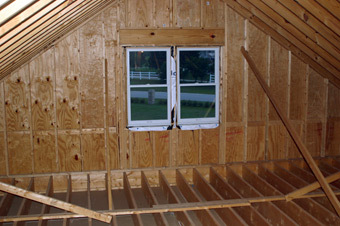 The attic, before construction began. Floor joists were doubled to 6" on center to increase load-bearing capability. LVL/microlam timbers under the new room. Here are some nutsnbolts of the room itself. The finished dimensions will be 23' 6" wide x 20' 1" deep. The kneewalls on each side of the room rise to 39.5" and then angle 10' 2" toward the center of the room to terminate in a 9' ceiling (8' across). There are only two windows, but they are located dead center of the wall where the speakers would be placed. One of my first steps was to consult a structural engineer so that I could start planning the initial stages of construction. These steps would involve the heavy carpentry work to make the room as solid and strong as possible. I had a few goals in mind -- to increase specifications such as wind load and load bearing -- but I needed an engineer to help me get from point A to point B. The most obvious initial requirement was that the rooms floor be built for massive load-bearing capability. My Wilson Audio Specialties Alexandria X-2 loudspeakers weigh around 700 pounds each, my WATCH Dog II subwoofer another 280 pounds. Add to these heavy-duty electronics, not to mention furniture to house the gear. It all adds up to over a ton of dead weight permanently located in one area of the room. The structural engineer, in our initial meeting, tossed out some specifications wed shoot for: greater than 240 pounds per square foot of load-bearing capability for the third of the room where the gear would rest, and in excess of 160 for the remaining two thirds of floor space. How would this be accomplished? In new construction it would be a fairly straightforward process, but retrofitting the room to meet these specifications was going to be a challenge. Issues as mundane as getting materials into the space would have to be thought out and planned for. Ever try getting 24 floor joists into a second-story room with only two hard-to-access windows? Good for you if you havent! But it had to be done in my case. The structural engineer specified doubling the number of floor joists from 2" x 12" lumber spaced 12" on center to 6" on center. This would not only increase the load-bearing capability of the floor but would also stiffen it greatly. Personal note: I cant stand flex in a floor, so this was a welcome suggestion. Whether it actually creates sloppy, boomy bass or not, a squishy floor would not sit well with me. 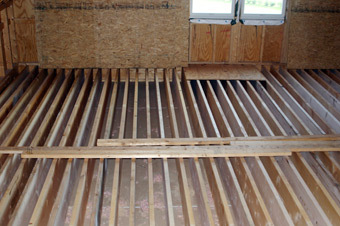 The additional floor joists were just the beginning of the floor-strengthening procedure, however. An approximation was made regarding the placement of the loudspeakers in the room so that that area could be heroically strengthened. The engineer specified either an LVL/microlam (laminated veneer lumber) or steel beam to be placed directly under the plane where the equipment would sit. Whether or not we used steel or lumber would depend on the logistics of installation. I would later find out that engineers like to make things as difficult as possible for the carpenters in the field. Note: dont get the engineer in the same room as the lead carpenter. One might not come out alive. In the end multiple LVLs (5) were chosen because of lighter weight. 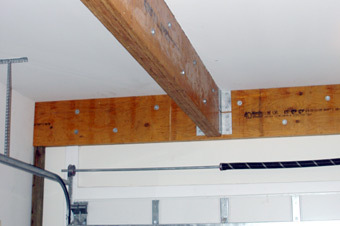 My garage ceiling -- where the beams would be installed -- is 12 high. Steel is heavier than wood, and the act of raising a steel beam and retrofitting it in a spot that wasnt designed to accommodate it was daunting. It would be dangerous and unwieldy, whereas multiple LVLs would be just manageable. Glued and caulked joints and seams make the room almost airtight. 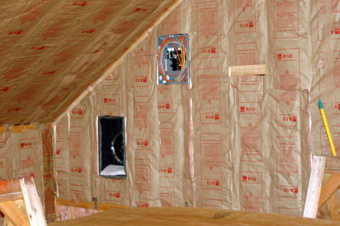 Insulation, a dedicated HVAC system, and an electrical sub-panel installed. 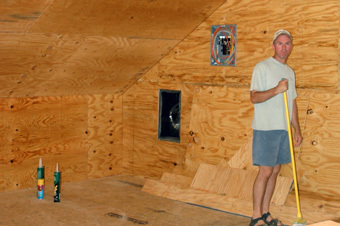 The room encased in plywood to stiffen and strengthen the shell. 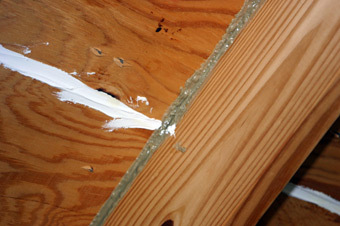 Two layers of sheetrock glued and screwed over the plywood. 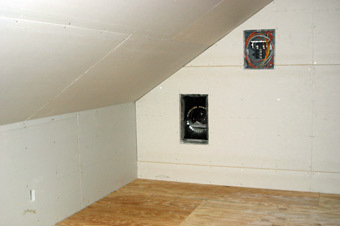 The rest of the initial room-construction details involved a number of steps designed for sound isolation and strength. 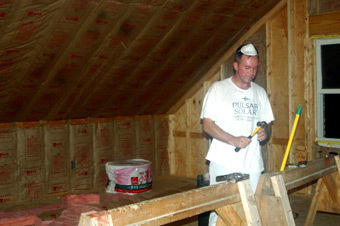 The walls and ceiling would consist of three layers: one of plywood and two of drywall. The layers would all be glued and screwed together, creating a very rigid, massive wall system. The flooring would be comprised of multiple layers as well, and all seams throughout the rooms shell would be filled, creating essentially an airtight room. Speaking of air, it gets hot and humid in the South, so I had a dedicated HVAC system designed strictly for the room. A generous number of air vents were specified to reduce air velocity and thereby lower noise. Electricity was another area I concentrated on. Two dedicated 20A lines were run using 10AWG Romex for the audio gear. Two dedicated 15A circuits, with multiple outlets on each line, were installed strictly for adherence to local codes and would be used for non-audio-related devices. Finally, one 240V line was also installed just in case a large amplifier was in for review that required such service. Shunyata Research Venom outlets were brought in for the equipment area. A 90A sub-panel to power all of this was located in the back corner of the room so that Id have quick access to all the electrical circuit breakers. To create an ideal listening space the acoustic properties of the room would be the most important single area to address. Although I knew I wanted the room to be acoustically as neutral as possible, I had a list of strict requirements regarding the individual or firm Id bring in to do the job. One prerequisite was that whoever did the acoustical design not sell room treatments or be affiliated financially with any company that does. I wanted someone with no interest one way or the other with the number of acoustical products prescribed for the room. Ive experienced a number of listening rooms that were chock-full of absorbers and diffusers of all types but whose sound was sub par. Ive often asked myself if the room treatment was applied according to a diagram with pre-prescribed "solutions," or, worse, randomly. "Terry Montlick Labs was founded in August, 2002. I started it to address the acoustics of home theaters and other home-audio environments. I wanted to introduce more science and objectivity to this field. We created the industry's first home-theater acoustical-quality program, Alpha Certification, and certified our first room in June 2003. THX has since gotten into the home-theater acoustical-certification business, but we continue to maintain about a two-year technical lead. "My background is pretty eclectic. Unlike many sound professionals, I am not a musician. As a teenager, I worked for Vincent Esposito, Frank Sinatra's personal sound engineer. Among other things, I worked on live sound for the Pops Concerts at Yale Bowl. But I got interested in sound from a filmmaking perspective. I was making indie films since before there was a name for them. I've mixed all my own film soundtracks. "My decision for college was to either go to film school or study science and engineering. I decided to go to MIT. I did my graduate work in neurobiological sound communication. I then joined Haskins Laboratories, one of the worlds leading speech-research institutions. I spent many years as a consultant in digital audio signal processing, and have five patents in this area. I've also done a great deal of software engineering, and have written a book on object-oriented programming [The Distributed Smalltalk Survival Guide, Cambridge University Press, 1998]. This background allows me to not only understand the many complex technical problems in acoustics, but to write custom software to solve them." The term "acoustical engineer" involves a specialized skill set, and is a term used freely among "experts." But what it means is often misunderstood, and is many times used by folks who profess a certain expertise but may not have the true technical chops to fit the bill. I asked Terry what someone searching for an acoustical engineer needs to look for in order to be assured that candidates have the correct skill set. Some of the answers may surprise you. "I first joined the Acoustical Society of America, the professional society for acousticians, in the late 70s. An acoustical engineer is an acoustician who is also an engineer. Acoustics is a branch of physics, and to deal with it in much detail, you need to know a good amount of science and math. It helps to understand such things as the wave equation, the fundamental differential equation that determines how sound waves travel and interact with their surroundings. "With fast computers, there are a host of software tools now available, such as for ray-tracing and Finite Element Analysis. But it is easy to misapply these tools if you don't understand their principles, assumptions, and limitations. If we are designing the acoustics for a new room, we simulate it with proprietary ray-tracing software -- the same as is used for designing concert halls, but tweaked to handle small-room acoustics." I asked Terry what he does when he initially measures a room, what data he gathers, and for a snapshot view of what he uses the data for. "The key piece of data we gather is the room's impulse response. We measure this from multiple listening positions. The impulse response is just that -- the response of the room to a very narrow pulse of sound. Ideally, this pulse is infinitely narrow, and will then contain sound components at all frequencies. You give the room a poke. It responds in a certain way. "The traditional method used by acousticians was to fire a starter pistol and run a paper-chart recorder. Now we have more sophisticated techniques, which can use pink or white noise to compute the impulse response to a high degree of accuracy. "The cool thing is that mathematically the impulse response is the complete acoustical signature of the room. From it, we can calculate such fundamental acoustical metrics as frequency response, reverberation times, and early reflections. We compare these with optimum values based on the purpose of the room -- home theater versus two-channel stereo, for example, tempered with the room owner's personal tastes." I next asked Terry to describe the most common acoustic problems he confronts in a listening room. "Nearly always, excess or uneven reverberation. An ordinary sheetrocked residential room is perhaps second only to a concrete bunker for excess reverberation. Another major problem is the existence of discrete early reflections (those occurring within the first 15 milliseconds or so after the direct sound hits your ears). Early reflections that are too loud will distort the front soundstage. These need to be either absorbed or diffused, so that the energy doesn't arrive in a single big wallop." A tired and worn Jeff Fritz soldiers on in the name of great sound. What youll read about in future installments of this series of "TWBAS" is the nutsnbolts acoustic-design work that will go into my listening room. Youll also read about the sonic results as I move my system into the new space. I do hope, with the help of Terry Montlick, to be able to provide some points to ponder if youre undertaking a similar project. If we dispel some myths and establish some basic principles along the way, all the better. Terry expounds: "The industry is plagued by acoustical guesswork, superstition, and downright humbuggery. It is as though a century of acoustical research never existed. Many experts' take few objective measurements, and can offer no quantitative evidence of acoustical performance." I will show you the measurements -- before and after treatment -- taken in my listening room. Youll know my environments acoustical performance -- warts and all -- when were done. After all, the acoustical performance of any room will shade the sonic performance of the system installed in it. Because I review some mighty highfalutin' gear, its only fair that you know as much about the environment I use for evaluation as I can provide.